For other uses, see Lund (disambiguation). Lund (/lʊnd/, also US: /lʌnd/ LU(U)ND, Swedish: [ˈlɵnːd] ( listen)) is a city in the province of Scania, southern Sweden. The town had 91,940 inhabitants out of a municipal total of 121,510 in 2018. It is the seat of Lund Municipality, Skåne County. Clockwise from top: Lund Cathedral and Lundagård; Lund University Main Building; Lund University library. Lund is believed to have been founded around 990, when Scania was part of Denmark. From 1103 it was the see of the Catholic Metropolitan Archdiocese of Lund, and the towering Lund Cathedral, built circa 1090–1145, still stands at the centre of the town. The city was ceded to Sweden in the Treaty of Roskilde in 1658, and its status as part of Sweden was formalised in 1720. Lund University, established in 1666, is today one of Scandinavia's oldest and largest institutions for education and research. The university and its buildings dominate much of the centre of the city, and have led to Lund becoming a centre for high-tech industry in the south of Sweden. Lund is sometimes mentioned as the oldest town or city in present-day Sweden, although it has only been a formal Swedish city for 300 years of its at least thousand year long history. It's so old that its origins are unclear, but was presumably existing by the end of the Viking Age. Until the 1980s, the town was thought to have been founded around 1020 by either Sweyn I Forkbeard or his son Canute the Great of Denmark. The area was then part of the kingdom of Denmark. But, recent archaeological discoveries suggest that the first settlement dated to circa 990, possibly the relocation of settlers at Uppåkra. The Uppåkra settlement dates back to the first century B.C. and its remains are at the present site of the village of Uppåkra. King Sweyn I Forkbeard moved Lund to its present location, a distance of some five kilometres (3.1 miles). The new location of Lund, on a hill and across a ford, gave the new site considerable defensive advantages in comparison with Uppåkra, situated on the highest point of a large plain. The city was made a see in 1048 and united with Dalby in 1060, and in 1103 became the see of the Metropolitan Archdiocese of Lund, whose ecclesiastical province comprised Scandinavia and even Garðar on Greenland. The diocese of nearby Dalby was absorbed in 1066. Lund Cathedral was similarly founded in or shortly after 1103. 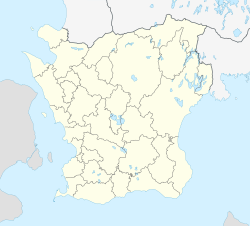 In 1152, the Norwegian archdiocese of Nidaros was founded as a separate province of the church, independent of Lund. In 1164 Sweden also acquired an archbishop of its own, although he was nominally subordinate to the archbishop of Lund. It is still, as the diocese of Lund, a diocese in the Church of Sweden. Lund Cathedral School (Katedralskolan) was founded in 1085 by the Danish king Canute the Saint. This is the oldest school in Scandinavia and one of the oldest in Northern Europe. Many prominent people were educated there, among them the actor Max von Sydow and several high-ranking politicians. Lund was ceded to Sweden in 1658 as part of the terms of the Treaty of Roskilde. It was recaptured by Denmark in 1676 during the early phases of the Scanian War. The exceptionally bloody Battle of Lund was fought just north of the city in 1679, and ended in a decisive Swedish victory; Swedish control of Scania was confirmed in the Peace of Lund later that year. Sweden's control over Scania, and hence Lund, was formalised by treaty in 1720. Scandinavia's first University, the Academy of Lund (Studium generale) was founded in 1425. It was suppressed during the Danish Reformation in 1536. The present Lund University was established in 1666. In 1943, during the Second World War, Lund was accidentally bombed by a British aircraft. No deaths were reported, though some people were injured by glass fragments. Over the second half of the 20th century the population of Lund more than doubled, driven in large part by the growth of the university and high-tech industries. For example, Tetra-Pak, the food packaging and processing company, was founded in Lund in 1952. Suburbs were added to the outer edges of the city: Klostergården, Norra fäladen and Linero in the 1960s, Norra Nöbbelöv in the 1970s, Gunnesbo in the 1980s and Värpinge in the 1990s. Kaspar Magnus Espman's map of Lund from 1784, showing the structure of the mediaeval centre. Lund is located in Sweden's largest agricultural district, in the south-west of Scania, less than ten kilometres (6.2 miles) from the sandy shore of the Öresund Strait. Its location on the south-facing slope of the Romeleåsen horst leads to the city rising from the low-lying Höje River in the south to 86 metres (282 feet) above mean sea level in the north. From the top of the Sankt Hans Hill it is possible to see Copenhagen, the capital of Denmark. The nearest large Swedish city, Malmö, is about 15 kilometres (9.3 miles) to the south-west. Other Swedish cities are more distant: Gothenburg is 250 kilometres (160 miles) away, the capital Stockholm is 600 kilometres (370 miles) distant, and Umeå lies 1,200 kilometres (750 miles) to the north. The central region of Lund largely retains its medieval street layout. A few buildings from the Middle Ages remain, including Lund Cathedral, Liberiet, St. Peter's Priory, the restaurant Stäket and Krognoshuset. Many of the buildings in the centre today were constructed in the late 1800s, including Katedralskolan, the Grand Hotel and the main building and library of Lund University. Lund city contains a number of squares. The main city square, Stortorget contains the city hall and numerous shops. Mårtenstorget, located south-east of the main square, hosts a market during the daytime and is otherwise used for parking. In earlier times the square was used as a cattle market and was known as Oxtorget. Alongside the railway and associated station are Bantorget, Knut den Stores Torg and Clementstorg. The latter hosts a small market and is planned to be the central terminus of the tramway currently under construction. Lund's most central park is Lundagård, which, together with the adjoining University square forms the centre of the University. The park is dominated by historic buildings including Lund Cathedral, Lund University Main Building, and Kungshuset. The trees of the park are home to a large colony of rooks. The much larger Lund city park is located south-west of the centre. The site was used for the Lund Exhibition in 1907 and subsequently developed into a public park between 1909 and 1911. The park contains planted gardens, a small lake, a children's playground and bandstands, as well as the swimming pool Högevallsbadet and the former buildings of Lund Observatory. It also has a menagerie that houses different varieties of birds. This has been protested by some animal rights activists. Other significant areas of parkland in the city include the Lund University botanic gardens and the articifial Sankt Hans Hill in the north of the city. Lund, like the rest of southern Sweden, has an oceanic climate. The climate is relatively mild compared to other locations at similar latitudes, or even somewhat further south, mainly because of its proximity to the sea. Because of Lund's northerly latitude, daylight lasts as long as 17 hours at midsummer, and only around 7 hours in mid-winter. Summers are warm and pleasant with average high temperatures of 23 °C (73 °F) and lows of around 14 °C (57 °F), but temperatures sometimes exceed 25 °C (77 °F) and occasional heat waves are common during the summer. Winters are cold, with temperatures steady between −1 to 3 °C (30 to 37 °F). Lund has arguably the mildest climate of the country in average highs. In terms of yearly means and average lows Falsterbo is marginally milder. Rainfall is light to moderate throughout the year with an average of 169 wet days. Snowfall occurs sparingly, mainly from December to March, but snow cover does not typically remain for a long time, and some winters are virtually free of snow. The old Rådhus in Stortorget is used as offices by Lund Municipality. Lund is governed by Lund Municipality. The municipality is responsible for the city of Lund, nearby settlements including Dalby, Södra Sandby and Veberöd, and the surrounding countryside. It reached its current form in 1974 following the absorption of a number of nearby municipalities. In 2014 the city itself was officially divided into 14 administrative divisions. The municipality is governed by a municipal assembly (kommunfullmäktige) of 65 members, who elect a municipal executive committee (kommunstyrelse) of 13 members. Since October 2018[update] the mayor and chairman of the executive committee (kommunstyrelsens ordförande) has been Philip Sandberg of the Swedish Liberal Party. The university dominates much of the centre of Lund. It was founded in 1666 following the transfer of Scania to Sweden under the Treaty of Roskilde and is the second-oldest university in Sweden after Uppsala University. Its traditional centre is in Lundagård park but stretches out towards the north east of the city where the large engineering faculty is located. Today Lund University is one of northern Europe's largest, with eight faculties, 41 000 students and over 2000 separate courses. It is rated in the world top 100 universities and is a member of the League of European Research Universities as well as the global Universitas 21 network. Katedralskolan, the cathedral school, founded in 1085, is the oldest school in Scandinavia. Today it is a gymnasium with about 1,400 students studying on five different programmes. The Royal Swedish Physiographic Society is a learned society based in Lund. The culture in Lund is characterised by the university education and research, and the large student population and student traditions, such as a student theatre group since 1886. A substantial part of the student night-life is located at student fraternities called 'Nations'. Lund Cathedral, the former Catholic and the now Lutheran cathedral in Lund, is the seat of the bishop of Lund of the Church of Sweden. Lund also has a city theatre (though without a professional local ensemble of its own) and a number of other places for concerts and theatres. Numerous prominent figures from the literary world lived and worked in Lund, often in association with the university and theatre. Prominent examples include Esias Tegnér, writer, poet and bishop, and August Strindberg, playwright, novelist and poet. A longer list is given below with other notable natives. The Lund novel is a genre in its own right, a bildungsroman in which a young student experiences life in Lund, Copenhagen and sometimes Österlen whilst maturing as an individual. The Lund novel is exemplified by the work of Fritiof Nilsson Piraten and Frank Heller. The spex are a form of student theatre particular to Nordic universities, with a strong tradition in Lund. They are parodistic musical plays, often setting well-known music to new lyrics and mixing up the historical and the present in unconventional intrigues. Comedians Hans Alfredson and Anders Jansson started their careers in the Lund spex. The concluding scenes in Ingmar Bergman's classic film Wild Strawberries are set in Lund. The Lund International Architecture Film Festival is held annually in the autumn. Lund has long been a regional centre for classical and church music. In particular, Lund is renowned for its vibrant amateur choir scene, with choirs such as Carolinae damkör, Domkyrkokören, Katedralkören, Lunds akademiska kör, Lund Chamber Choir (Swedish: Lunds Kammarkör), Lunds Studentsångförening, Lunds vokalensemble, and the Svanholm Singers. Since 2006, Lund has been the host of the biannual Lund International Choral Festival. Classical orchestras based in the city include the Lund City Orchestra, the Academic Orchestra and Lund New Chamber Orchestra. In more recent decades, Lund has also developed a lively pop and jazz scene. The cultural venue Mejeriet opened in 1987 in a former dairy building just outside the city park. It has hosted concerts by both well-known and emerging bands. The pop singer and television presenter Måns Zelmerlöw was born and grew up in Lund. Artists associated with Lund include DJ and record producer Axwell, rock musician Kal P. Dal, rapper Timbuktu, indie pop group The Radio Dept., and singer and songwriter Amanda Jenssen. The Lund carnival has been held every four years since the mid-nineteenth century: traditional accounts say it originated at a wedding in 1849 (the four-year intervals place the party in 2002, 2006, 2010, etc.). Arranged by the students of the university, from the 1950s onwards the event has grown in size and intensity (with some 5500 volunteers 2010), but it remains an amateur event. Midway between a music and stage fair, a city festival, and an outpouring of satire, parody and general madness. Some students dress up in costumes, often relating to and poking fun at current issues, and parade in wagons. Others perform humorous skits in the evenings. The carnival revues and other stage entertainments have launched a number of well-known entertainers and actors over the years. The Bosmåla cottage is part of the open-air museum Kulturen, which hosts a collection of historical Skanian buildings. Lund hosts the largest open-air museum of Scania, Kulturen. Kulturen is the second oldest dedicated open-air museum in the world and consists of more than 30 buildings, as well as large collections on Scanian art, crafts, local archaeology and history. The museum was founded in 1892 by Georg Karlin. Today the museum often hosts different exhibitions and its visitors can experience how Swedish people lived and worked throughout the centuries. Several museums are attached to the university. The Lund University Historical Museum is based in the Lundagård park and hosts exhibitions related to the history of the university, city and cathedral. The Museum of Sketches for Public Art is a unique museum of sketches and drawings of artworks during their development. The Lund University Zoological Museum is the oldest and largest in the country. The Sparbanken Skåne Arena is a large sports hall adjoining the city park in Lund. Until 2014 it was known as the Färs och Frosta Sparbank Arena. Lund is not a notable centre for sports except for handball, where it has two teams in the men's top league: H 43 and LUGI HF and two teams in the women's top league: H43/Lundagård and LUGI. Lund hosted matches from the 2011 Handball World Championship in the Färs och Frosta Sparbank Arena. It also has a chess team, Lunds ASK, that for decades has been among the top teams in Sweden. Lund has two Division 1 football clubs, Torns IF and Lunds BK. It is also the birthplace of the online football manager game Hattrick. Lugi Rugbyklubb, based in Lund, is one of Sweden's few rugby clubs. Lund has been connected to the motorway network since 1953 when the E22 was opened between Lund and Malmö. The E22 was the first motorway in Sweden, and was originally built around the edge of the town; however following the expansion of the suburbs out to the east in the latter half of the 20th century it now passes through the city. The E22 forms the main north-south trunk route through Lund. The largest east-west road is the multi-lane northern ring road which also passes through the city limits. There are also other connections to most major roads in the area, for example the E6 via Riksväg 16, and the Länsväg 108 which connects to the E65. Lund has been praised for its cycling infrastructure. There are 4,800 bike parking spaces in the town, including a multi-storey facility at the railway station, over 260 km (162 mi) of cyclepaths and cycle lanes, and 43% of journeys within the city take place by bicycle. There has been no increase in car usage for the past 10 years. Lund is a railway junction and is well served by rail traffic. The main railway station, Lund Central, is Sweden's third busiest railway station, with around 37 000 passengers per day as of 2013[update]. Another, smaller station serves the suburb of Gunnesbo in the north-west of the city. Lund has been on the Southern Main Line, which connects Malmö and Stockholm, since it opened in 1856. The West Coast Line to Gothenburg branches off the Southern Main Line just north of Lund Central station. Thus there are direct services to all of Sweden's three largest cities, as well as to Copenhagen and Helsingør via the Öresund Bridge. Rail services to Denmark, and within Scania and neighbouring counties, are mainly provided by the Øresundståg. These trains are operated jointly by Skånetrafiken in Scania and the Danish State Railways in Denmark. Longer distance services, notably to Stockholm, are provided by SJ. Local traffic is served by the Pågatåg electric multiple units, which provide stopping services within Scania. Since 2013[update] the bus network in Lund has been licensed to the Nettbuss Stadsbussarna company, overseen by Skånetrafiken. They operate green-coloured buses which, for environmental reasons, are powered by compressed natural gas. The busses run on a total of eight bus lines. A survey carried out on behalf of Region Skåne in 2015 found that 11% of Lund residents used the bus network regularly. Plans to initiate a tram network to achieve faster and higher-capacity public transport between Lund Central Station and many of the largest work-places in the city were approved in 2015. The initial tram line, under construction as of 2016[update], is due to open to traffic in 2019. It will connect Lund Central station with the hospital, Lund University, the MAX IV synchrotron light source, and, the European Spallation Source. There are also longer-term plans to extend this network to the suburban towns of Dalby, Staffanstorp and Södra Sandby. Lund is located about 26 kilometres (16 mi) from Malmö Airport, which is mainly used for domestic flights. The much larger Copenhagen Airport offers a much larger selection of international destinations, and is about 33 minutes by train from Lund. There also used to be a very small airstrip, Hasslanda Flygfält, to the south of Lund, mainly used for private and charter flights. The airstrip closed in 2008. The main factory building of Tetra Pak, located in the south of Lund. Lund is a regional centre for high tech companies, several of which are based in the north-east of the city. Companies with offices in Lund include Sony Mobile Communications, Ericsson, Arm Holdings, and Microsoft. The Swedish telecommunications company Doro has its head office in Lund. Gambro, one of the key companies in the development of the artificial kidney, was founded in Lund in 1964 and retains a significant presence in the city. Alfa Laval, the international manufacturer of heat exchangers and separators, have a factory in Lund, and TetraPak have their headquarters and part of production in town. Other important industries include pharmaceuticals, biotechnology e.g. Active Biotech, and publishing and library services. Skåne University Hospital and Lund University are major employers, with extensive research facilities. In particular, the Lund Institute of Technology has connections with high-tech industry in the city. A science park, Ideon Science Park, was founded in 1983 as a collaboration between Lund University, Lund Municipality and Wihlborgs Fastigheter AB. As of 2016[update] it hosts about 350 companies, employing 2700 people. Many of these are high tech companies that have ties to the university. The 2010s have seen the development of two major research facilities in Lund, both in collaboration with the university. MAX IV is the world's most powerful synchrotron light source and a Swedish national facility. It was inaugurated on 21 June 2016. The European Spallation Source (ESS) is a pulsed neutron source under construction on a site just north of MAX IV. ESS is expected to directly employ about 450 people when it is completed in around 2023. Tetra Pak was founded in Lund in 1951 by Ruben Rausing. Their principal product is packages and equipment for aseptic packaging of food, principally using plastic-coated cardboard. As of January 2015 Tetra Pak employed around 3500 staff at their headquarters in Lund. The pharmaceutical company Astra Zeneca used to have a large presence in Lund but their offices closed in 2010. The site was re-developed as a research park named Medicon Village. As of 2016[update] over 1200 people work in more than 100 organisations based at Medicon Village. Måns Zelmerlöw, pop singer and winner of Eurovision Song Contest 2015. Lund Principle, an important principle in ecumenical relations between Christian churches. ^ "Localities 2010, area, population and density in localities 2005 and 2010 and change in area and population". Statistics Sweden. 29 May 2012. Archived from the original on 17 December 2012. ^ "Lund". The American Heritage Dictionary of the English Language (5th ed.). Boston: Houghton Mifflin Harcourt. 2014. Retrieved April 13, 2019. ^ "Lund". Collins English Dictionary. HarperCollins. Retrieved April 13, 2019. ^ "Lund" (US) and "Lund". Oxford Dictionaries. Oxford University Press. Retrieved April 13, 2019. ^ "Lund". Merriam-Webster Dictionary. Retrieved April 13, 2019. ^ "Folkmängd i riket, län och kommuner 30 juni 2018 och befolkningsförändringar 1 april–30 juni 2018. Totalt". Statistiska Centralbyrån. ^ "Start - Lunds universitet". Archived from the original on 2006-12-07. ^ Cohen, Sidney (1977). "The Earliest Scandinavian Towns". The Medieval City. New Haven, CT: Yale University Press: 313–325. ^ "Uppåkra - en forntida centralort". Archived from the original on 19 August 2010. Retrieved 23 May 2010. Herbermann, Charles, ed. (1913). "Lund" . Catholic Encyclopedia. New York: Robert Appleton Company. ^ Frost, Robert I. (2000). The northern wars : war, state, and society in northeastern Europe, 1558 - 1721 ([Nachdr.] ed.). Harlow [u.a. ]: Longman. pp. 208–216. ISBN 978-0-582-06429-4. ^ 3 juli 1720 - Riksarkivet - Sök i arkiven Archived 2015-01-28 at the Wayback Machine. Sok.riksarkivet.se. Retrieved on 2015-06-24. ^ Fredstraktat, tillige med dend: over bemelte Freds-tractat forfattede ... - Google Břger. Books.google.dk. Retrieved on 2015-06-24. ^ "Upp och ner för teologin i Lund". lu.se. 15 December 2016. Archived from the original on 10 August 2017. Retrieved 3 May 2018. ^ "Akademiet i Lund". www.netleksikon.dk. Archived from the original on 1 April 2016. Retrieved 3 May 2018. ^ Breitner, Lena (11 November 2013). "70 år sedan bombregn föll över norra Lund". Skånska Dagbladet. Archived from the original on 6 March 2018. Retrieved 5 March 2018. ^ Claval, Paul (2016). Landscapes, Identities and Development. Routledge. ISBN 9781351923446. Retrieved 1 January 2019. ^ a b Wickström, Margareta. "Lunds historia - Uppleva & göra". Lund (in Swedish). Retrieved 1 January 2019. ^ "Lund C tramway stop". Lunds kommun. Archived from the original on 22 December 2016. Retrieved 21 December 2016. ^ a b "Precipitation Averages 1961-90". SMHI. April 2015. Retrieved 21 April 2015. ^ a b "Statistics from Weather Stations (Swedish)". SMHI. March 2016. Archived from the original on 20 February 2015. Retrieved 18 March 2016. ^ "Politik och demokrati". lund.se. Lunds Kommun. Archived from the original on 26 December 2016. Retrieved 25 December 2016. ^ Kuprijanko, Alexander. "Philip Sandberg stiger in i rampljuset". Sydsvenskan. Retrieved 19 February 2019. ^ "Utrikes födda efter län, kommun och födelseland 31 december 2014". scb.se. Statistics Sweden. Archived from the original on 12 May 2015. Retrieved 25 December 2016. ^ "Facts and Figures". Retrieved 2018-07-26. ^ Eriksson, Marianne. "Localities 1960-2005" (PDF). scb.se. Statistics Sweden. Archived from the original (PDF) on 23 June 2011. Retrieved 25 December 2016. ^ Hedeklint, Karin. "Localities and urban areas 2015" (PDF). scb.se. Statistics Sweden. Archived (PDF) from the original on 31 October 2016. Retrieved 25 December 2016. ^ Lund University (2016). "Lund University presentation brochure" (PDF). Lund University. Archived (PDF) from the original on 9 October 2016. Retrieved 27 December 2016. ^ "The Times Higher Education World University Rankings 2016". Timeshighereducation.co.uk. Retrieved 2016-07-05. ^ "About Lund University - Lund University". Lund University. 2016-07-05. Archived from the original on 2016-07-18. Retrieved 2016-07-05. ^ Paulin, Örjan. "Katedralskolan – En mini-historik". lund.se. Lunds Kommun. Archived from the original on 2017-08-27. ^ Björck, ingela. "Finansierande sällskap verkar i det tysta". Lunds Universitets Magasin. Lund University. Archived from the original on 6 March 2018. Retrieved 5 March 2018. ^ Lundaspexarna. "Lundaspexarna". Archived from the original on 2014-03-29. ^ Qvist, Per Olov; von Bagh, Peter (2000). Guide to the Cinema of Sweden and Finland. Greenwood Publishing Group. p. 34. ISBN 0313303770. Archived from the original on 2018-03-04. ^ Hallgren, Martin (16 November 2015). "Montezuma gör comeback i AF-Borgen". Sydsvenskan. Archived from the original on 5 March 2018. Retrieved 4 March 2018. ^ Qvist, Per Olov; von Bagh, Peter (2000). Guide to the Cinema of Sweden and Finland. Greenwood Publishing Group. p. 195. ISBN 0313303770. Archived from the original on 2018-03-04. ^ "Lund International Architecture Film Festival". archfilmlund.se. Lund International Architecture Film Festival. Archived from the original on 4 March 2018. Retrieved 4 March 2018. ^ "Lund Choral Festival". Lund Choral Festival. Archived from the original on 2012-03-22. ^ "Mejeriet". Kulturportal Lund. Archived from the original on 18 January 2017. Retrieved 16 January 2017. ^ Wiman, Max (14 January 2011). "VM-skandal i Lund". Sydsvenskan. Archived from the original on 12 March 2018. Retrieved 11 March 2018. ^ "The city where bicycles dominate". BBC News. 2009-12-03. ^ Holgersson, Emma. "CYKELSTRATEGI 2013 - 2017" (PDF). Tyréns. Archived (PDF) from the original on 21 December 2016. Retrieved 21 December 2016. ^ Svahn, Görel. "Lunds station tredje störst". Sydsvenskan. Archived from the original on 22 December 2016. Retrieved 21 December 2016. ^ Samuelsson, Jan (29 June 2012). "Nettbuss tar över stadsbussarna". Sydsvenskan. Retrieved 5 March 2018. ^ Åk grönt med Skånetrafikens stadsbussar Archived 2010-08-14 at the Wayback Machine, (in Swedish) Retrieved July 24, 2010. ^ "Välkommen ombord på Lunds stadsbuss" (PDF). Skånetrafiken. Archived (PDF) from the original on 6 March 2018. Retrieved 5 March 2018. ^ "Resultat från webbenkät om nytt linjenät". Region Skåne. Archived from the original on 6 March 2018. Retrieved 5 March 2018. ^ "Historiskt beslut – spårvägen är klubbad". Sydsvenskan. 17 November 2015. Archived from the original on 22 December 2016. Retrieved 21 December 2016. ^ "Spårväg Lund". sparvaglund.se. Archived from the original on 2014-02-09. Retrieved 2014-02-22. ^ "Spårväg Lund - Projektet i korthet". Archived from the original on 22 December 2016. Retrieved 21 December 2016. ^ Andersson, Elisabeth. "75 jobb bort i Lund när Baxter flyttar forskning och utveckling". 8till5.se. Archived from the original on 22 December 2016. Retrieved 22 December 2016. ^ "Ideon Science Park". Horn International AB. Archived from the original on 23 December 2016. Retrieved 22 December 2016. ^ Lindskog, Anna-Lena. "Världens starkaste synkrotron invigs". Umeå University. Archived from the original on 18 September 2016. Retrieved 22 December 2016. ^ "MAX IV and ESS". Lund University. Archived from the original on 19 December 2016. Retrieved 22 December 2016. ^ "Tetra Pak history". tetrapak.com. Tetra Pak International S.A. Archived from the original on 4 December 2016. Retrieved 22 December 2016. ^ Satz, Lotta (13 January 2015). "70 tjänster bort på Tetra Pak i Lund". Sydsvekskan. Archived from the original on 22 December 2016. Retrieved 22 December 2016. ^ "Medicon Village". Medicon Village. Archived from the original on 2016-01-09. ^ "About Medicon Village". mediconvillage.se. Archived from the original on 14 May 2016. Retrieved 22 December 2016. Wikimedia Commons has media related to Lund. Wikivoyage has a travel guide for Lund. "Lund" . New International Encyclopedia. 1905. "Lund" . Encyclopædia Britannica (11th ed.). 1911.